Is the mom-and-pop church becoming obsolete? Just as one-stop shopping behemoths such as Walmart and Amazon are fulfilling the retail needs of America’s consumers, larger churches are increasingly meeting the spiritual needs of America’s faithful. Is the mom-and-pop church becoming obsolete? Just as one-stop shopping behemoths such as Walmart and Amazon are fulfilling the retail needs of America’s consumers, larger churches are increasingly meeting the spiritual needs of America’s faithful. New research indicates a decline in attendance at the great majority of the nation’s churches, while churches attracting 400 people or more on Sundays are dramatically increasing their market share. In just the last decade, the median weekend worship attendance in U.S. congregations declined from 129 to 80, according to the Faith Communities Today 2015 survey. In 2005, less than half of congregations had fewer than 100 people attending services; by 2015 nearly six in 10 sanctuaries failed to break the century mark, the study found. The National Congregations Study revealed a similar, if not slightly larger drop-off, with median attendance at all weekend worship services declining from 100 people in 2006 to 76 people in 2012. At the same time, larger congregations are not only reporting substantial growth, but are leading the trend toward multi-site churches and expanding their brands to increasingly larger areas, according to researchers. Let’s put the findings into perspective: Just 7 percent of U.S. congregations have 400 or more members, but they contain half of churchgoers, according to a new analysis of the latest wave of the National Congregations Study. So while in 2012 the average congregation had only 70 regular participants and an annual budget of $85,000, the average person in the pew worshipped in a congregation with about 400 regular participants and a budget of $450,000. “There is a lot to say about congregational size, but one fact is fundamental: Most congregations in the United States are small, but most people are in large congregations,” reported Duke University sociologist Mark Chaves, the study director. The “Little House on the Prairie” image of a small wooden church serving as a gathering place for the community is still imprinted on the American psyche. But the sweeping cultural changes that have devastated many rural communities and small businesses have not bypassed religion. Choosing a neighborhood church or even one from the denomination you were raised in is increasingly less important to church shoppers than finding the best spiritual fit for themselves and their families. More worship options: A church of 70 people is most likely only to have one weekend service celebrated in a traditional manner. Large congregations are better able to offer multiple services with a mix of contemporary and traditional worship. More worship resources: Small congregations often may be fortunate to hire a new seminary graduate or a retired cleric as their pastor. Larger congregations are not only more likely to have a pastor who is an excellent preacher, but qualified staff in areas from music to youth ministry. More opportunities for meaningful social networks: Small churches can be more personal, but large congregations often excel at creating small groups offering regular spiritual support to groups of individuals with shared experiences and interests. Young adults, divorced individuals, new parents and individuals struggling with addiction are more likely to find a network of close friends they can rely on for spiritual growth in a larger congregation. More programming: The more diverse opportunities congregations offer, from Bible study groups to athletic teams, the more likely they are to get people in the door and integrated into the congregation. What may be most attractive to today’s generation of worshippers, Chaves said, is the ability to be as active as they want. Small congregations are more likely to ask everybody to make significant contributions of money and time. Larger congregations offer individuals alternatives to be more anonymous or to select an area they want to serve in from a wide range of choices. The move toward greater concentration of worshippers in fewer sanctuaries will plateau at some point, but it does not seem likely in the foreseeable future, researchers state. Many small churches today stand on the precipice, with aging, shrinking congregations struggling to make ends meet. Meanwhile, the congregations richest in members and resources appear to be getting richer. A separate study of megachurches found more than seven in 10 reported average attendance increased more than 10 percent from 2009 to 2014, with about a third reporting growth of 50 percent or more. Larger congregations also are at the forefront of the move to expand to surrounding communities with satellite churches. Just 3.4 percent of congregations overall had multiple sites in 2012, but 16.5 percent of congregations with 500 or more adult participants had more than one location, the National Congregations Study found. For reasons ranging from the need to serve sparsely settled areas to their great strengths in creating intimate communities, small churches will continue to be a major part of the American religious landscape. But like small outfits everywhere in a rapidly changing society, they are being challenged to be more innovative to meet the challenges of larger competitors. 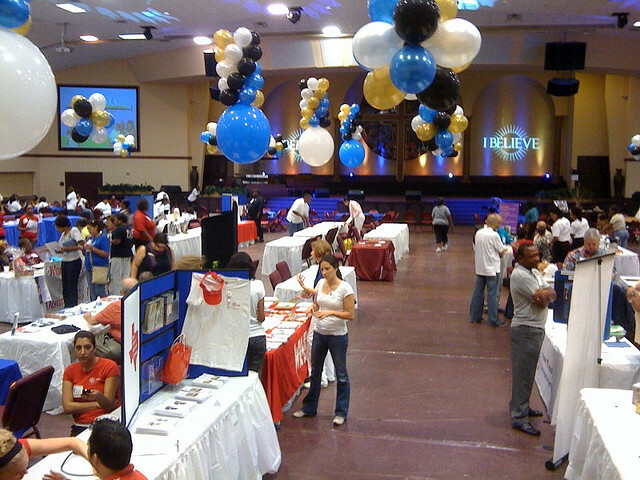 To maintain personal connections in large congregations, Thumma said, megachurches had to be creative in areas such as nurturing meaningful small groups, developing lay leaders and placing great emphasis on hospitality ministries that make people feel welcome as soon as they enter the sanctuary. One other point to keep hope alive: Just as Jeff Bezos began the company that would become Amazon operating out of his garage, so, too, did many of today’s megachurches begin with a few people in a living room or, as in the case of Joel Osteen’s Lakewood Church, a gathering at a converted feed store. This article, written by David Briggs for Ahead of the Trend, is reprinted with permission from the Association of Religion Data Archives. Join us as we honor the bold and resilient women leaders dedicating their lives to advance justice in our time. We know that you grapple with many difficult questions as a Christian leader. We want to help. Complex concerns about ministry can’t be fully addressed here, of course, but we provide a starting point for engaging the deep issues. If you don’t find what you are looking for, please see if our partners can help or contact us.